A recent construction defect case demonstrates the importance of performing a “transition study” as soon as governance of a condominium association is transferred from developer to unit owner control. One of the most important challenges facing the first unit owner controlled board of directors is to determine whether the developer-created budget and reserve fund are adequate to cover the cost of maintaining the condominium’s construction over time. It is important to note that budgets and reserves are calculated based on the assumptions that the condominium facilities are constructed properly and have a normal life expectancy (e.g., a 25 or 30 year roof). Making such an assumption can be costly. Construction defects in the original construction can cause unanticipated repair and replacement expenses that wreak havoc on an association’s financial condition and long-term stability. 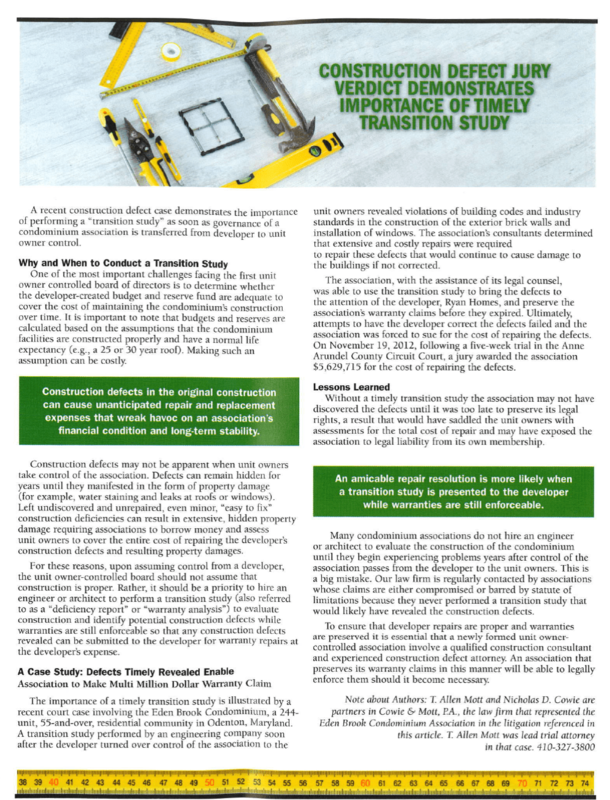 Construction defects may not be apparent when unit owners take control of the association. Defects can remain hidden for years until they manifested in the form of property damage (for example, water staining and leaks at roofs or windows). Left undiscovered and unrepaired, even minor, “easy to fix” construction deficiencies can result in extensive, hidden property damage requiring associations to borrow money and assess unit owners to cover the entire cost of repairing the developer’s construction defects and resulting property damages. For these reasons, upon assuming control from a developer, the unit owner-controlled board should not assume that construction is proper. Rather, it should be a priority to hire an engineer or architect to perform a transition study (also referred to as a “deficiency report” or “warranty analysis”) to evaluate construction and identify potential construction defects while warranties are still enforceable so that any construction defects revealed can be submitted to the developer for warranty repairs at the developer’s expense. The importance of a timely transition study is illustrated by a recent court case involving the Eden Brook Condominium, a 224-unit, 55-and-over, residential community in Odenton, Maryland. A transition study performed by an engineering company soon after the developer turned over control of the association to the unit owners revealed violations of building codes and industry standards in the construction of the exterior brick walls and installation of windows. The association’s consultants determined that extensive and costly repairs were required to repair these defects that would continue to cause damage to the buildings if not corrected. The association, with the assistance of its legal counsel, was able to use the transition study to bring the defects to the attention of the developer, Ryan Homes, and preserve the association’s warranty claims before they expired. Ultimately, attempts to have the developer correct the defects failed and the association was forced to sue for the cost of repairing the defects. On November 19, 2012, following a five-week trial in the Anne Arundel County Circuit Court, a jury awarded the association $5,629,715 for the cost of repairing the defects. Without a timely transition study the association may not have discovered the defects until it was too late to preserve its legal rights, a result that would have saddled the unit owners with assessments for the total cost of repair and may have exposed the association to legal liability from its own membership. Many condominium associations do not hire an engineer or architect to evaluate the construction of the condominium until they begin experiencing problems years after control of the association passes from the developer to the unit owners. This is a big mistake. 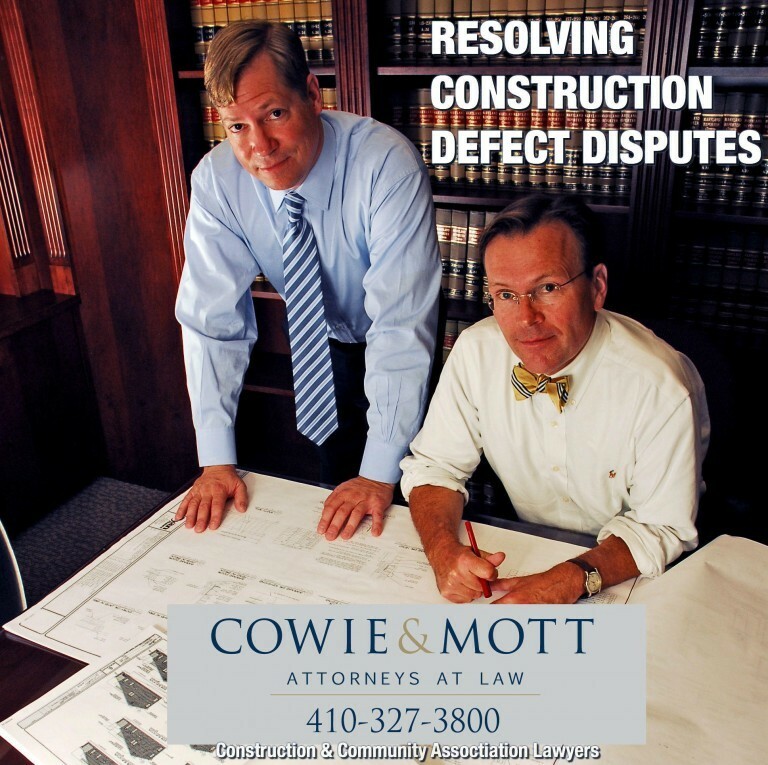 Our Maryland construction law firm is regularly contacted by associations whose claims are either compromised or barred by statute of limitations because they never performed a transition study that would likely have revealed the construction defects. An amicable repair resolution is more likely when a transition study is presented to the developer while warranties are still enforceable. To ensure that developer repairs are proper and warranties are preserved it is essential that a newly formed unit owner-controlled association involve a qualified construction consultant and experienced Maryland construction lawyer and condominium construction defect attorney. An association that preserves its warranty claims in this manner will be able to legally enforce them should it become necessary. 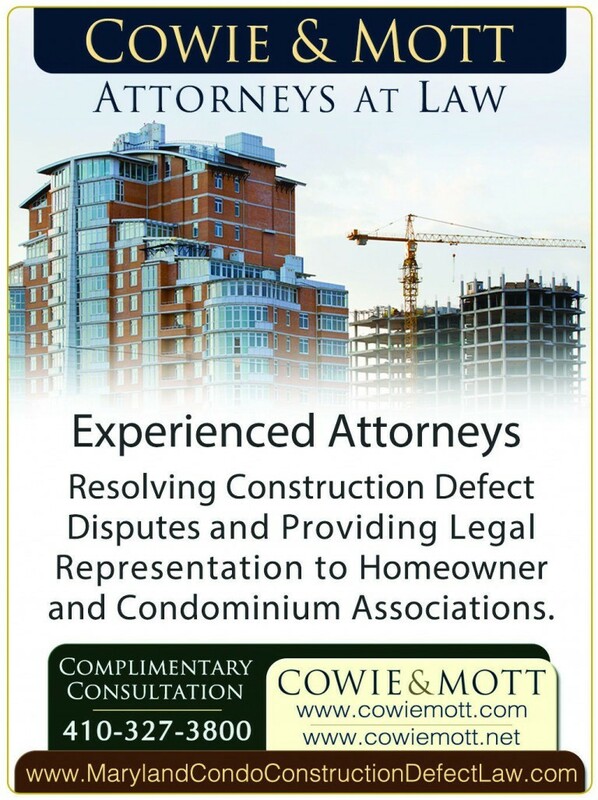 Note about Authors: Construction Defect Law Attorneys T. Allen Mott and Nicholas D. Cowie are partners in Cowie & Mott, P.A., the construction defect law firm that represented the Eden Brook Condominium Association in the litigation referenced in this article. T. Allen Mott was lead trial attorney in that case.